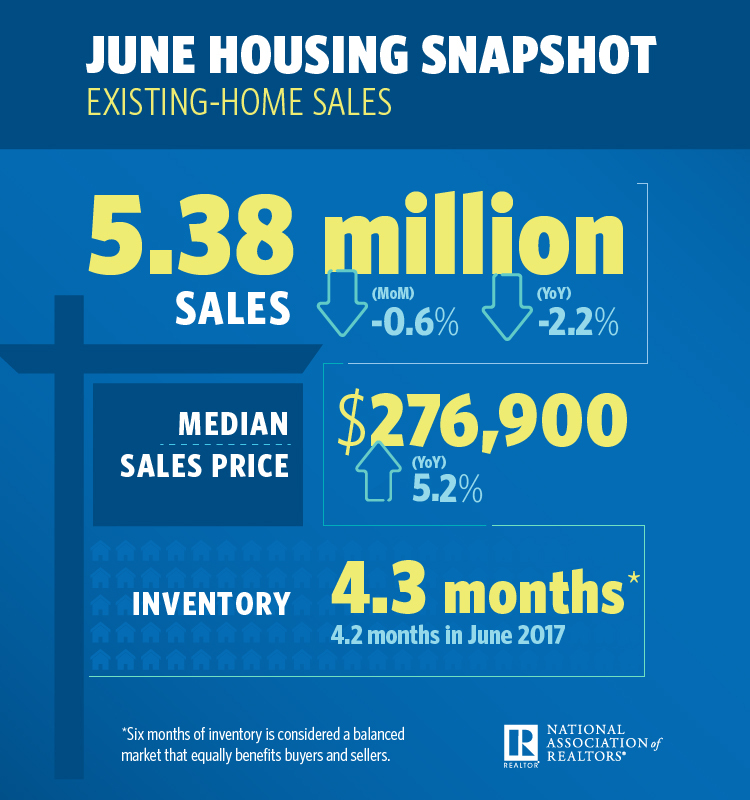 Barely budging against imbalanced inventory, existing-home sales slipped at the start of summer, the National Association of REALTORS® (NAR) reports. Activity in June declined 0.6 percent to 5.38 million, down 2.2 percent from the prior year; however, inventory increased 4.3 percent to 1.95 million, and is 0.5 percent higher than the prior year—the first increase year-over-year since June 2015. “It’s important to note that despite the modest year-over-year rise in inventory, the current level is far from what’s needed to satisfy demand levels,” says Lawrence Yun, chief economist at NAR. 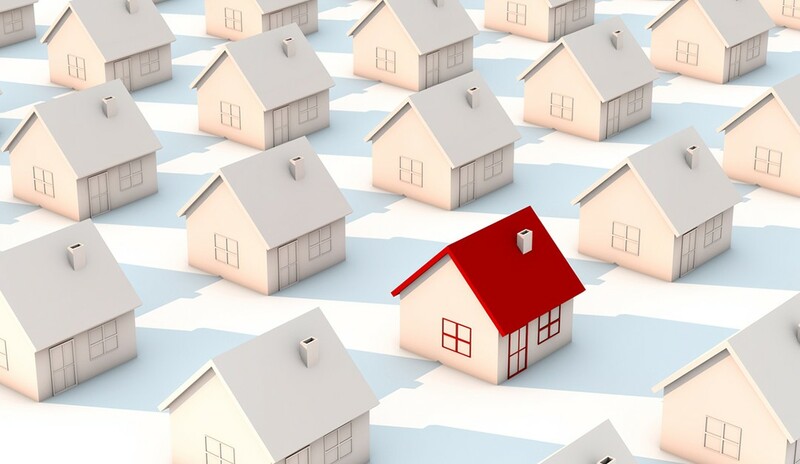 “Furthermore, it remains to be seen if this modest increase will stick, given the fact that the robust economy is bringing more interested buyers into the market, and new-home construction is failing to keep up. Currently, inventory is at a 4.3-month supply. In June, existing homes averaged 26 days on market, two days less than the prior year. All told, 58 percent of homes sold were on the market for less than one month. In June, the metropolitan areas with the fewest days on market and the most realtor.com® views, according to realtor.com’s Market Hotness Index, were Midland, Texas; Columbus, Ohio; Boston-Cambridge-Newton, Mass. ; Fort Wayne, Ind. ; and Boise City, Idaho. The median existing-home price for all house types (single-family, condo, co-op and townhome) was $276,900, a 5.2 percent increase from the prior year. The median price of an existing single-family home was $279,300, while the median price for an existing condo was $258,100. Existing-home sales in the single-family space came in at 4.76 million in June, a 0.6 percent decrease from the 4.79 million in May, and a 2.3 percent decrease from the 4.87 million the prior year. Existing-condo and -co-op sales came in at 620,000, no different from May, but a 1.6 percent decrease from the prior year. Twenty-two percent of existing-home sales in June were all-cash, with 13 percent by individual investors. Three percent were distressed. Two of the four major regions in the U.S. experienced higher sales: the Midwest, increasing 0.8 percent to 1.27 million, at a median $218,800; and the Northeast, increasing 5.9 percent to 720,000, at a median $305,900. There were no gains in the South and the West, with sales in the South down 2.2 percent to 2.25 million, at a median $237,500, and sales in the West down 2.6 percent to 1.14 million, at a median $417,400. Additionally, first-time homebuyers comprised 31 percent of existing-home sales, no different from May.